Drobo B810n, Drobo Storage Products, Drobo Inc. The B810n has dual Gigabit Ethernet ports. These can be bonded together to provide approximately twice the read/write performance you get via a single port. Or they can be used to provide a connection to two different subnets. Furthermore, they can be used in an “active/passive” mode so that if one port fails the other takes over. Don’t worry about compatibility — Drobo the B810n works with computers running OS X, Windows, or Linux operating systems. By default, the Drobo B810n uses the SMB file sharing protocol to talk to OS X or Windows. If you set up a share for Time Machine backup, it uses Apple’s AFP protocol. Linux users pick which file sharing method to use on their system. One or more Macs on a network can use the Drobo B810n for storing their Time Machine backups. Create a separate shares for use by Time Machine and assign them a maximum size. This lets users control how much space Time Machine uses, and stops it from taking over all storage on its backup target. 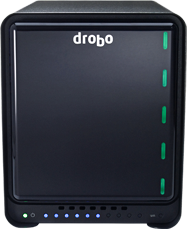 Drobo protects your data from loss in the event of a sudden power outage. This protects directory structures ensuring Drobo will remount on your computer. Drobo has a battery inside that powers RAM memory. When there is a power outage, data is stored on internal flash-based nonvolatile storage. Your data is safe until power returns. The battery recharges itself and lasts for the life of the product. 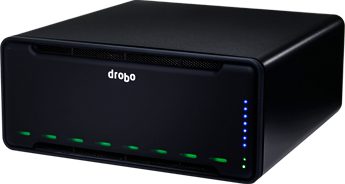 DroboApps also add functionality to your Drobo B810n. Whether it’s cloud back up provided by either Crashplan or Elephant Drive or the video and music streaming offered through the Plex media server, these simple-to-install apps extend the capabilities of your Drobo B810n. 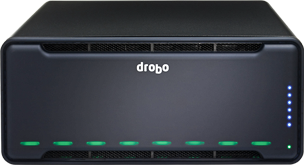 DroboCare is simple, powerful protection for your Drobo storage. The DroboCare support program extends your peace of mind beyond the standard warranty term and phone support included with your Drobo purchase. In fact, DroboCare gives you more, even during your standard warranty period.